If you thought the novelty photobooth idea was just a recent trend, think again. 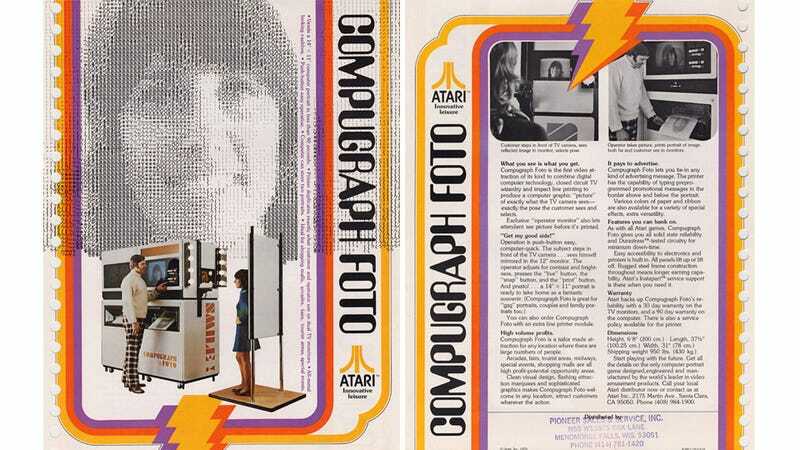 Back in 1976—the year before Atari released its ground-breaking 2600 console—the company was hawking these fantastic Compugraph Foto booths that created retroriffic ASCII portraits of people. The subject was photographed in front of a stark-white background with a live video preview monitor. Ninety seconds later, a built-in dot-matrix printer spat out an 11x14-inch portrait with the likeness converted into ASCII art. The 950-pound wheeled cabinet could easily be reduced to a simple app these days, but there's something still oddly appealing about having the results as an actual dot-matrix printout. So forget the hackneyed Instagram booth at your wedding. See if you can dig up one of these contraptions—and maybe some awesome checkered pants.